Merry Christmas! For those of you who were unable to be with us at St Thomas for our Christmas Eve service, here is a copy of my Christmas Eve sermon. I hope, wherever you are and whoever you are with, that the light of Christ is born within your hearts this day! Many of us grew up with different Christmas traditions – things you do every Christmas. In the Fisher house, we have a very special angel that sits on top of our Christmas tree. My mother sent each of her kids this Christmas angel to put on their trees. Putting that angel on the tree each year has always been a special moment, and who got to do it was always a big deal. Traditions are important at Christmas – in our homes and in church as well. Each year we hear the story from Luke’s gospel about the birth of Jesus. This is my 60th Christmas, and I have heard that story every year! Sometimes hearing the same story over an over can seem like it’s old hat – we know this, we’ve heard this, nothing new here. But we Christians believe that Scripture is the living Word of God; that it always has something to say to us, right here, right now in the world we live in. So what does this Christmas story have to say to us tonight here in Amenia? Something I often tell the parish when they are hearing a story from Scripture for the umpteenth time, I tell them to listen carefully and see what jumps out at them this time. What did you notice that you had never noticed before? That’s what I did these past weeks getting ready for Christmas. And the thing that jumped out at me this time more than ever before was Mary. It hit me how terrifying and dangerous this situation was for her. Think about it – she was no more than 15 or 16 years old. Unwed, betrothed, promised to Joseph but not yet married. She was poor, and lived in a culture that stoned women to death when they were found to be pregnant out of wedlock. This is what the angel called Good News! This is what the angel means by being honored, favored, chosen! Yikes! 29 years ago this Christmas Doug and I were waiting for the birth of our first child any day. My situation could not have been more different from Mary’s. I was 30 years old, married, educated, employed. I was surrounded by a loving, supported family who were thrilled at the prospect of this new baby. I lived in a warm house with plenty of food and every possible contraption one could ever need to raise a child. I had all this, and still I was TERRIFIED! Mary had nothing – she had shamed her family, she had no supportive community around her, except for her cousin Elizabeth. She was poor and in danger, with nowhere to lay her head as she gave birth. And yet, through all this, Mary was able to say Yes to God. She didn’t have to, but she did. Because she knew her God and knew how God had worked through history , how God was continually faithful to God’s people. That’s exactly what Mary did. She didn’t ask a million questions about how this was going to be for her, she didn’t ask God to take care of her, or make it easier, or fix what didn’t work in the situation. She responded with the greatest YES in all of history. She got involved in what God was doing. Because she knew her life, and all of life was already blessed. She knew that God was at work in the world and she wanted to be part of it. She said yes to being a” God-bearer” for the world. This Christmas , we are reminded again that THAT is what we are called to be. We are invited to be God-bearers to the world. We are the ones that can bring the light of Christ into the places of darkness in our lives and in our world. Jesus was born in that stable over 2000 years ago, but his light lives on within each of us. And we are called to share that light with all whom we meet, friend and stranger alike. But that is such a difficult thing to do these days. The world is a scary, and precarious place. Greed and hate and anger and ignorance rise endlessly. Violence has become commonplace. Terrorism is back on the front burners of our minds. Where do we begin to be light in the midst of such darkness? There’s a great story about Charles Schulz’s show “The Charlie Brown Christmas Special”. 50 years ago Charles Schulz wrote that classic Christmas special featuring the world’s favorite pessimist, Charlie Brown, and his band of friends. Charlie Brown is trying hard to find the meaning of Christmas, to stem the tide of commercialism and materialism and find the true meaning. But his friends will have none of it. They are all wrapped up in the commercialism of the season. In complete exasperation, he yells at the top of his lungs, “can anybody tell me the true meaning of Christmas?” And who steps forward but Linus, the little boy who constantly clings to his beloved security blanket. “He says “I can, Charlie Brown”, and proceeds to recite the story of Jesus’ birth from Luke’s gospel, the one we heard tonight. There he is holding on to his security blanket – this blanket he never lets go of. THid blanket that lets him know he is alive. He clings to thi blanket until he gets to the line where the angels say to the shepherds “Fear Not!” At that moment, Linus drops his blanket. He drops the thing that he depends on to keep him feeling safe and secure to announce the news that Christ has been born. It is the only time in the history of the Peanuts comic strip that we ever see Linus not holding his blanket. Charles Schulz did this on purpose to make the point that, whatever it is we are holding on to as our security blanket — money, prestige, being well thought of, alcohol, food, being cynical and snarky, living with a protective shield around our hearts – whatever it is we hold on to, we don’t need it anymore. On this night, we can drop it, because the light has come into the world and the darkness will never put it out. Christ has come to tell us that there is another way, a way out of the darkness, into the light. We can put down whatever our own security blanket may be and cling to the light, to Christ. We can trust that God is here, active in our world, active in our lives , even when we can’t see it or don’t understand. Remember Mary – you couldn’t find a more precarious situation, and yet she was able to enter into what God was doing in her life and in the world, because she knew it was blessed. Even when the world couldn’t see the blessing, she could. Some scholars believe that Jesus was born not in a stable, but in a cave. That’ s where people would have kept their animals in ancient Israel. I like that image of Jesus born in a cave. Sr. Doris Klein says “We all carry a cave, a hidden place within us, into which God longs to be born. ” We all have a dark place, a wound that needs healing, a fear that keeps us from reaching out, a loss that is paralyzing. We all have something like that inside us. That is our cave within. And that is exactly where Christ longs to be born within us. In that place. Christ longs for us to let go of whatever keeps us from opening our hearts and let the light of Christ be born in that place within. Only then can we become God-bearers to the world, when we allow Christ to light the darkness within us. Joseph Campbell said : “We have to be willing to let go of the life we planned so as to have the life that is waiting for us.” Mary let go of the life she thought she would have in order to be part of God’s life and God’s work. That is how she found the life that was waiting for her. That is how the light came into the world. That is my prayer for all of you tonight – that you are able to open your hearts and let God be born into the cave within you. I pray you can get involved in what God is doing and bring that light and blessing to others, no matter how dark it may be. “I will light candles this Christmas. Candles of joy, despite all the sadness. Candles of courage where fear is ever present. Candles of peace for tempest tossed days. Candles of love to inspire all of my living. May it by so, this Christmas, and evermore. Amen. Last night I led a Blue Christmas service at St. Thomas. This is a service for people who, for a variety of reasons, are struggling during the holiday season. It’s a service of quiet, candlelight and music. For many of us at St Thomas, grieving is the order of the day this Christmas season. I share with you my sermon from last night’s Blue Christmas. I am struck by the contrast for me of this service last year and this service this year. Last year I spoke from expertise. This year I’m speaking from experience. I am one of the broken hearted this year. And I have found if you are trying to do Christmas the way the world says it should be done, then it is awful to be one of the broken hearted. And if you try to do Christmas the way “it’s always been done,” frustration is dissatisfaction will be the order of the day. Because this isn’t like any other Christmas. We are broken hearted this Christmas. But I have also found that if I welcome in the broken heartedness, as it is, not trying to change it or make it something different, make it better – there is a depth in that place that can speak to me about God in this season. Two people’s writings have really spoken to me this Advent. Bishop Alan Gates of Boston and Thomas Merton. Alan wrote about how much of Christmas is about wishes. We wish for so many things – they tend to be tangible, ( like gifts), fairly immediate and mostly all about us. Sometimes our wishes are for things that are far beyond our control. But we that follow Christ are not about wishes at Christmas. We are about hope. And hope is different. He talks about hope not as a sentimental, airy fairy kind of thing. He talks about hope as robust! Christmas wishes will come and go swiftly enough. But hope is neither quickly fulfilled or quickly dismissed. I wish with all my heart that my sister was still here, that the terrible brain hemorrhage she suffered never happened. I wish we could go back and do that all over, change how things were. And I know with complete certainty that that will never, ever happen. That wish will never ever come true. But hope is different. Hope is what allows me to put one foot in front of the other. On this road with no horizon, in a situation that I can’t imagine ever being better, Hope is that small voice that whispers to me over and over “This is not the end. You may not be able to see it, or imagine it, but there is more life coming. New life. Different life. Even in the midst of this darkness, there is light. And life and endless love. I think that’s the same voice that gave Mary hope as she faced this brutal situation for a teenaged Jewish girl. I can’t even imagine the terror she must have felt when faced with the prospect of this situation. She was literally facing her own death – the law said she would be stoned to death if found to be pregnant out of wedlock. But she faced that situation, as it was, without adjusting any of it, and took the next step, and walked on that path with no horizon. One foot in front of the other. Because she had hope in the promises of her God. So often our kind of hope is “I hope this will end. I hope this will get better. I hope I will stop feeling this way.” And then we feel let down when that doesn’t happen. Merton is saying that right here, right now, just as things are, Christ is present. Nothing has to be different for us to experience the love and compassion of Christ. And right here, right now, there is more life. Our world as we know it has ended. But that doesn’t mean that life has ended. There is more life, even though we cannot see it on this road with no horizon right now. Our imaginations can’t imagine how things could ever be better. But God’s imagination can. That is the hope I stand in this Christmas. It grounds me in the moment, as it is, full of sadness and heartache. But without despair. This Christmas, I celebrate that the light has come into the world, and the darkness can never put it out. It is the greatest gift I will get this Christmas. I pray it for all of you as well. Wherever you are right now in your hearts and souls, know that this is not the end. There is more life coming. There will be joy again. It will be different than before. But it will be real and deep and true. Underneath all of this pain and disruption of life is a hum that is God, that grounds us in the sacred and healing love, that tells us , As Julian of Norwich says, that “All shall be well, and all shall be well and all manner of things shall be well.” This Christmas, may it be so. Amen. Tomorrow, Monday, January 5, we at St Thomas will begin the Bible Challenge — we are going to read the Bible together in one year! I love to see the look on people’s faces when I talk to them about this. Some look at me quizzically, as if to say “And how exactly is THAT going to happen?” Some look at me confused, like I just said the parish is going to walk to the moon together. Some just look nauseous when I mention it (you know who you are!). Are we really going to read the whole Bible, word for word, every single bit? Kind of, but in small doses. Each day we will assigned one reading from each of the parts of the Bible — the Old Testament (also known as the Hebrew Bible), the Psalms, those beautiful and heart wrenching poems who some believe were written by King David (although most scholars think otherwise), and the New Testament, including the four gospels (Matthew, Mark, Luke and John) and the letters of St Paul. Each day will have a short synopsis of what we will be reading, some questions to ponder and a short prayer to say as you begin. How will I know what to read and when? At the top of each page will be the book we are to read along with which chapter. For instance, on Day 1, we will be reading Genesis (the first book of the Hebrew bible) chapters 1-3 (about 3 pages), Psalm 1 (6 verses long) and the first chapter of the gospel of Matthew (1 page). I don’t know anything about the Bible. How will I understand what I am reading? There is no need to have any prior knowledge or understanding of the Bible in order to participate in the Bible Challenge. The daily synopsis will be very helpful in giving a good overview of what you are about to read. You can also post questions to this blog that I will happily answer. We will be having periodic discussion groups following Sunday service to ask questions and talk about what we are reading. I’m using the Poverty and Justice Bible given to us by the Lilly Foundation. What are these orange highlighted passages throughout the Bible? Part of the purpose of this challenge is to get a better understanding of God’s call to be peacemakers and care for God’s people. Those are the passages that highlight our call as Christians to be a voice for the voiceless and to work for justice and peace throughout our world. Am I supposed to believe what i read, word for word? Episcopalians take the Bible seriously, but not literally. This is not a history book. It is a the salvation story of God and God’s love for God’s people written by those who have gone before us. We believe Scripture to be inspired, the Living Word. It is not static. It speaks to us here and now in our lives and in the context of our world. But we do not read it literally. I don’t know if I believe in all this. Should I even be reading the Bible? You are EXACTLY who should be reading the Bible! Most of us know so little about the Bible, and much of what we know has been distorted. The Bible Challenge is an invitation to give it a try, to look at this important book with new eyes, an open heart and a mind filled with your question and doubts. Bring it all to the experience. You are invited to come as you are and see where God leads you. Things happen. Try to keep up as best you can. After the habit has been established, you will actually look forward to doing the readings each day. i promise! I don’t know…. I still feel a little nauseous! You’re starting a new thing — it’s normal to feel anxious. But what have you got to lose? Give it a try. No judgments. See where it takes you. I hope this helps answer your questions. I am looking forward to making this journey with you this year! If you haven’t already received your Bible Challenge book and the Poverty and Justice Bible, please stop by the Parish house and pick them up. 10 Things Peter Enns Wishes Everyone knew about the Bible…….. The Bible can be a very difficult book to read and understand. I remember when I was going to seminary, the thing I was most excited about was studying Scripture. I was finally going to understand what I was praying all these years! Often, though, I was left with more questions than answers. Talking snakes? Walls falling down with only a shout? Really? And then there’s the violence — hard to get our minds around all that. How are we to understand this ancient book in our modern times? Episcopalians believe that the Bible is the Living Word of God. That means it speaks to each of us in our own place and time. It’s not a static document that is to be read literally and never questioned. It is dynamic, alive and very much applicable to our day and age. 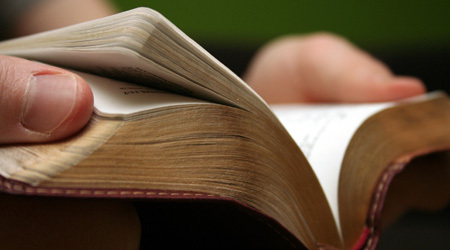 Starting in 2015, we at St Thomas are taking the Bible Challenge: Read the Bible in a Year. Following the book by the same title, edited by Marck P. Zabriskie, we will read a passage from the Old Testament , Psalms and New Testament and reflect on the questions for each day. It is a great way to get an overview of the Bible, learn the stories of our faith and start to try grapple with those things in Scripture that give us pause. I recently read a great blogpost At Faithstreet.com written by the theologian and scholar Peter Enns. He writes about the 10 things he wishes every person knew about the Bible. It’s a great primer for us as we prepare for our Bible Challenge, and just a good, clear explanation on how to approach Scripture in a dynamic way. I share it with you below. Thank you, Peter Enns. 1. The Bible doesn’t answer all — or even most — of our questions. Many of our questions, even some of the more pressing questions we face daily, aren’t answered in the Bible. The Christian Bible isn’t an answer book but a story of how Jesus answers for us the biggest question of all: what God is like. 2. The Bible isn’t like God’s version of Apple’s “Terms and Conditions” agreement. The Bible doesn’t lay out before us God’s terms and conditions, where failure to adhere to one clause in the middle of page 87 will cause a breach of contract and banishment from God’s graces. The Bible is more like a grand narrative that reorders our imaginations and holds out for us an alternate way of seeing reality — with God at the heart of it rather than ourselves. 3. The Bible isn’t a sourcebook for fighting culture wars. The Bible isn’t a club we use to gain political power or a way of forcing secular culture to obey our rules. America is not God’s country and the Bible isn’t its constitution. Stop it. Don’t listen to those T.V. preachers. The Bible isn’t a step-by-step guide to success, as if buried there are deep secrets for being happy, healthy, and rich. It is a book that shows what dying to self and surrendering to God are about. The Bible crushes our egos. 5. The Bible is open to multiple interpretations, not just one meaning. The Bible is ancient and obscure, and its stories are “gapped” and flexible, which allows—even demands—readers to interpret the Bible legitimately in various ways. This is exactly what has been happening among Jews and Christians for over 2,000 years. 6. The Bible invites debate. An extremely important lesson for Christians to learn from Judaism is that the Bible invites debate. In fact, it can’t avoid it, given how open it is to multiple interpretations. Winning Bible feuds with others, getting to the right answer, isn’t the end goal. The back-and forth with the Bible, and with God, is where deeper faith is found. 7. The Bible doesn’t “record” history objectively but interprets it. The biblical writers didn’t try to get history “right” in the same sense an author of an academic textbook does. Instead, they interpreted the past in their place and time, for their own communities, to answer their own questions of faith. That’s why the Bible contains two very different “histories” of Israel and the four Gospels that recount Jesus’ life differently. 8. The Bible was written by Jews (and at least one Gentile in the New Testament) in ancient times. This may sound too obvious to say, but it’s not. The biblical writers were ancient writers expressing their faith in God using the vocabulary and concepts of their ancient cultures. When we transpose our language and concepts onto biblical writers, even if we are trying to understand the Bible, we will actually distort it. 9. The Bible isn’t the center of the Christian faith. Some form of the Bible has always been a part of the life of the church, but the Bible isn’t the center of our faith. God is — or, for Christians, what God has done in and through Jesus. The Bible doesn’t draw attention to itself, but to God. 10. The Bible doesn’t give us permission to speak for God. At least not without a lot of wisdom and humility behind it. Knowing the Bible is vital for Christian growth, but it can also become intoxicating. We don’t always see as clearly as we might think, and what we learn of God in the Bible should always be first and foremost directed inward rather than aimed at others. Pick a Name So We Won’t Forget….. I chose Naomi. There were 276 girls kidnapped in Nigeria, but I chose Naomi. I chose her name s I would remember to pray for her and for all of them. The crime of these girls, according to their kidnappers, is that they were pursuing an education. The kidnappers say Western education must stop. Girls should pursue marriage. They kidnapped these girls to sell them as slaves. To sell them into marriages. The kidnappers say they should be sold into marriage starting at age 9. I chose Naomi so I wouldn’t forget. I remember meeting the girls at the Women’s Vocational Center in Ghana. I was struck by their beauty, their enthusiasm, their hearts filled with hope for a better future. 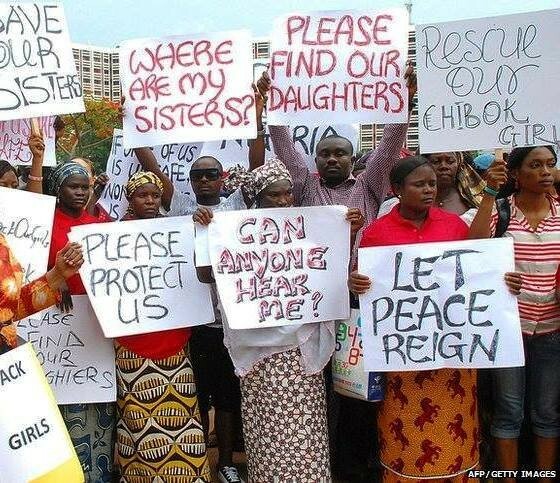 I bet these Nigerian girls were filled with hope as well. Until April 14th when everything changed. Read more about it here . So please pick a name. Pick one and pray for her everyday. Pray for her as a reminder of all the girls in captivity right now. We only have 180 of the 276 names. Pray for one. Pray for them all. All through Lent, I blogged about forgiveness, and the guiding light of those blogs was Mpho and Desmond Tutu’s book The Book of Forgiving. Today is the first day of the Tutu Global Forgiveness Challenge, based on this incredible book. This is a 30 day program led by Tutu and his daughter Mpho. It is a wonderful opportunity and I can’t think of a better way to spend the Easter season than expanding our hearts and mind and learning how to forgive. It asks for 15 minutes a day and it is done in the privacy of your own home. The second part of Tutu’s fourfold path of forgiveness that I think is pure brilliance is this concept of renewing or releasing the relationship. Tutu says once you have granted forgiveness, then you decide if you are going to renew the relationship or release the relationship. So many of us think that if we forgive someone, we are just going to go back to the way things were before. And most of us find that idea impossible. So we often think the only alternative is to end the relationship completely, usually with very hard feelings. But Tutu says there is another way. We can choose to renew the relationship, knowing that what was before can never be the same again. We are not restoring a relationship to its previous form. We don’t go back to before the hurt and pretend it never happened. When we renew the relationship. we set upon creating someone new and different, encompassing the suffering. There is an awareness that you are someone who has hurt me. and I am someone who can hurt you. But we choose instead to take another path. Tutu says the renewed relationship can be deeper because we have faced the truth together, recognized our shared humanity, and now tell a new story of a relationship transformed. Tutu says that renewing the relationship is always the preference. But sometimes it is simply not possible. Sometimes we simply do not know who has harmed us. Or sometimes it can be a matter of safety. This person who hurt us cannot be trusted , for whatever reason, not to do the same damage to you over again. Renewing the relationship might actually harm you further. In that case, we release the relationship. This is so very different from holding a grudge and never speaking to someone again. To release the relationship means you choose to not have someone in your life anymore, but you release that person without wishing them any ill. We offer forgiveness and release them to continue on their life path. Releasing frees us from victimhood and trauma. It is refusing to allow a person or experience to occupy any space in your head or your heart any longer. And, Tutu says, you not only release the person, you release your old story of the relationship. This Holy Week is the ultimate story of renewing. Jesus takes the torture, the rejection, the injustice, the abandonment, and turns it into a completely new story. From the cross he looks down on these people who have done this to him and says, “Father, forgive them, for they know not what they do.” He offers forgiveness and chooses to renew God’s relationship with humanity in a whole new way. And nothing would ever be the same again. I believe forgiveness is the key to healing humanity and bringing peace into the world. If each of us were intentional about forgiveness in our own lives, our own communities, think of the ripple effect that would have? Like a stone dropped into a still lake, sending ripples out for miles. If you are still holding on to a wound and refusing to forgive, perhaps this Holy Week is a good time to consider the fourfold path of forgiveness. Or if you have hurt someone and are in need of forgiveness, perhaps this is the week to think about reconnecting and seeing how forgiveness can create a new story. Dying and Rising. New life. That is what Holy Week is all about.